It’s always some variation of “How big of a battery do I need to run my (fill in the blank) radio?” It comes up a lot, not just in my email but also on the various forums and blogs I visit. The question is too open ended and comes with too many variables to give a definitive answer, but there are some basic battery concepts that will help you sort through this confusing topic. Before asking the question, provide some answers. It certainly does not help that many of the answers floating around the internet are based on guessing, hypothetical conditions, and overly generous manufacturer data. Before you can know how much battery you “need”, first find out how much power all your stuff consumes and what you plan on doing with it in the real world. Off Grid Ham reader James (whose question was the inspiration for this article) asked about going off grid with his Yaesu FT-450 radio. The official Yaesu specifications state that this radio consumes maximum 22 amps/304 watts on transmit, and 0.55-1.5 amps/8-21 watts on receive depending on the audio level (these numbers are rounded). James wants to run his radio with a 35 amp hour AGM battery and charge it with a 2 amp plug in charger. He plans on adding a solar panel at a later time. So what can he realistically expect from this setup? A 35 amp hour battery can provide 35 amps for one hour. This is known as the C-rate or 1C-rate. The 2C-rate would be 17.5 amps for two hours, the 3C is 11.66 amps for three hours, and so on. Following the math, the 35 amp-hour battery should push James’ 22 amp transmitter for a little over ninety minutes. In the receive only mode, assuming an average of 1 amp, the battery will go for 35 hours. But let’s deconstruct this. Under most conditions an amateur will be transmitting only part of the time, and even then, the radio will not continuously pull maximum amperage. A modulated signal will cause the current to swing up and down, hitting the peaks only momentarily. In fact, the radio will draw continuous peak power only when transmitting in the AM mode, which is seldom used anyway. Duty cycle is expressed as a percentage and is the term used to describe the ratio of transmit to receive. If your duty cycle is 50%, that means you split your radio time equally between talking and listening. Keeping your duty cycle low (ie, don’t run your mouth on the air too much) will stretch battery life. Battery performance varies greatly depending on the temperature, age of the battery, and internal characteristics. Even identical batteries can yield different results due to small inconsistencies in the manufacturing process. There is also the rule of diminishing returns: From the moment a battery is placed into service, its abilities begin to degrade. Whatever performance you get on Day One, it will only go down from there. I mentioned earlier that manufacturer claims are overly generous. I’ll bet a gold microphone that the average 35 amp hour battery, even a brand new one, will not produce 35 amps for an hour. It might not hit 35 amps at all. Do not ever expect a battery to perform to its published specifications. The development of lithium batteries has brought actual results closer to marketing hustle, but lithium batteries are still too costly for the average amateur. One way to get more runtime from a battery is to turn down the transmit power. I heavily promote QRP operating here on Off Grid Ham not only because I personally like it, but because it has real, practical value in that it conserves a lot of energy for only a modest sacrifice in signal effectiveness. Getting back to the question…how much can James get from a 35 amp hour battery when hooked up to his FT-450? We’ve gone over the math: Depending on his duty cycle, he’ll have at most a few hours of operating time if he’s running full power. There is one last wrench in this motor. The 22 amps/304 watts specified for the FT-450 is predicated on a 13.80 volt power supply. An AGM battery will likely not even take a charge to 13.80 volts, and if it does, it won’t stay there once the battery is placed on a load. As the voltage drops, the radio will continue to work but will not put out full rated power. Ultimately, the radio may operate erratically or shut down completely. Some radios, such as the FT-817, easily tolerate voltage swings and will work between 8.00 up to about 16.00 volts. Do some research on your particular model and find out how low the supply voltage can go before you have problems. You could end up in a situation where you have an otherwise good battery that isn’t useable because the radio is too picky. Or, the radio works on receive but shuts down when you try to transmit because the voltage drops too low. Going in reverse: Charging the battery. James said he was using a 2 amp charger. So the calculation would look like this: 35 amp-hours÷2 amp charge= 17.50 hours. This general purpose formula is not 100% accurate for all battery types, but it is a good basic rule that will get you close enough. Seventeen-plus hours for a fill-up makes for a very long wait! Once again, let’s bring it into the real world. That charge time assumes a fully dead 0% charge. And of course, no one lets that happen! Suppose the battery is 50% full when placed on the 2 amp charger. Then we’re looking at about half of that 17.50 hours, or 8.75 hours. That’s still a long time. What advice would you give James? If you suggested bumping up the charge current, congratulations…you’ve been paying attention. 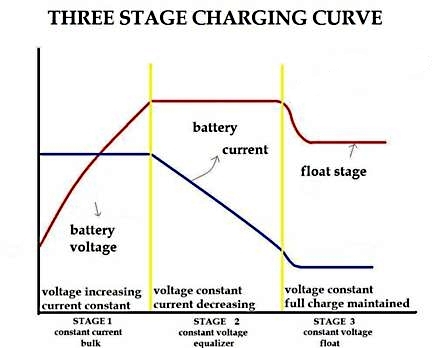 The main concern when increasing charge current is that if it’s pushed too high, it will cook the battery. The sweet spot would be the maximum charge current that can be applied without stressing the battery. 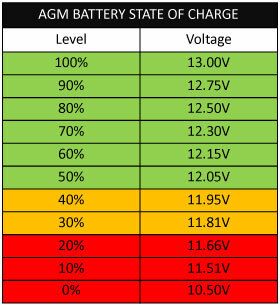 For AGM batteries, the magic number is 20% of the amp hour rating. Twenty percent of 35 is 7. At seven amps of current, how long will it take to get James’ battery charged up? 35 amp-hours ÷ 7 amp charge= 5 hours. Don’t forget that five hours is for a 0% charged, totally dead battery. If we start with a more realistic 50% charge, then our recovery time drops to 2.50 hours. That’s not bad at all. Walking and chewing gum at the same time. It’s not enough to have sufficient current to charge your battery in a reasonable amount of time. In an ideal off grid setup, you’ll also want power to run your equipment simultaneously. This is a careful balancing act that requires filling the battery faster than you drain it while still having extra juice to run your gear. On top of that, you must contend with the fact that whatever you are using as a fuel source (solar, wind, etc.) is not consistently available. For this illustration, we’ll use solar panels as a main power source. Because we took the time to do some research (and didn’t just wing it) we confirmed that we’ll need about 1.00 amp or so just to operate the FT-450 in an idle receive mode, plus (ideally) a 7.00 amp charge current. That’s a baseline of eight amps before we’ve even started transmitting. A 130 watt solar panel will produce a little over 7.00 amps, but that’s at full sunlight. You’re not going to have full sunlight all the time. At this point there is a choice to be made: 1) Go with the 130 watt panel knowing it is just barely enough. When the sun isn’t strong, the battery will fill in the hole. The solar extends battery time up to a point, but you’re probably discharging the battery faster than you can fill it and eventually the tank will run dry. If the sun is strong, the solar will do most of the work but you’ll still have to mind your duty cycle to avoid getting ahead of your available power. 2) Add more solar capacity to give yourself some “headroom” when the sun is weak. If you do it right, you can operate all day and still have a 100% charged battery at sundown. In either case, we’ve already determined that the 35 amp hour battery alone will not push the FT-450 on full power transmit for very long, and a 2 amp charger will technically work but will have an unacceptably long charge time. When it gets dark and you lose your solar, you’ll either need to go off the air, reduce transmit wattage, switch to another electric source such as a gas generator, or have enough additional batteries (with corresponding solar capacity for charging) to pull you through the night. Before doing anything, know how much power you will really need. Do not guess. Use real numbers. C-rate is how much current a battery can provide for one hour. It is synonymous with amp-hours. Duty cycle is the ratio of transmitting to receiving, expressed as a percentage. Duty cycle is a huge factor in how long your battery will last. Manufacturer battery specifications cannot be completely trusted and are usually overly generous. For AGM batteries, the maximum safe charging current is 20% of the amp-hour rate. An effective off grid operation will be able to charge a battery faster than it is drained. Determining how much battery you “need” depends on your operating goals and power demands of your equipment. Battery University is an outstanding go-to source for everything there is to know about batteries. You’ll never have time to read everything that’s there. I LOVE this website! It deserves a bookmark in every radio amateur’s computer. Here is an easy on-line calculator that will quickly compute charge times. Absorbed Gas Mat (AGM) batteries. Thank you for the post. I currently have a single 55ah AGM battery for my go box setup(combined with a generator), but I’m planning to upgrade that to a battery bank wired in series for better performance. Very nice article Chris. I’ve bookmarked this one so I can forward this to people instead of trying explain it myself, and the Battery University is a great resource. I’ve bookmarked that one too. I always look forward to your articles. Thanks! Hello again Randall. Thanks for being such a dependable and consistent reader and supporter. Off Grid Ham does not pay for promotion or advertise on other sites. I rely solely on referrals from readers who liked what they saw and passed it on, and whatever Google incidentally sends me. Every time someone posts a link to one of my articles on social media, internet forums, club newsletters, or via personal email, they are helping advance amateur radio. I happened to check my web metrics this morning and found out that traffic to Off Grid Ham has increased 73% in the last three months. This is a direct result of readers like you spreading the word. Thanks for your confidence and loyalty. You did a great job on this article. It took me only several minutes to read as compared to the hours spent on Battery University and other websites years ago to get the same information. Hi Phil, I’m proud to produce original articles that are understandable and relatable. A lot of what’s already out there is technically accurate but hard to follow. My goal is to condense it down to the information that really matters and present it in a format that any amateur can apply to their real world situation. Off Grid Ham does not deal in theories or abstract concepts. This is a place for people who actually go out and do stuff. Hi Chris, add me to the peanut gallery, but I think I’m already included. This was another great article/post. I had to think for a second about printing a hard copy or commenting first… so now I have to copy and print it! And thanks for including those other links -will be very useful… and I’ll bookmark too! It’s funny I was just running numbers on this stuff the other day. They sure look different working w/ the 817! 😉 I’ve been looking at Bioenno Power -high energy density batteries, and they have their own controllers and solar panels -although I’m not sure if they actually mfgr them or not. Have heard good things from one operator down in TX, but need to investigate a bit further. Some travel plans have been postponed so I’ll likely do some gearing-up soon. You have been my Ham radio guru for a couple of years now… pretty much since you started the blog -I think you beat me out the blog gate by a few months or so! Keep up the good work! Hi Mike, as I’ve mentioned to others I am very grateful for your ongoing support. I used the FT-450 as an example but the math can be applied to any radio. The FT-817 needs between 0.250-0.450 amps on receive and about 2.00 amps on transmit. Keeping in mind you will not be pulling full current all the time, a 10 amp hour battery should satisfy most amateur’s needs. One reason I push QRP so much is that it allows the operator to scale everything down, saving money, space, and weight. I have not personally used Bioenno Power products, but the name comes up a lot in ham radio circles and and they are highly respected. Once again thanks for your good will. We’ll see on the other side!